This pride of lions satiated their thirst after gorging on an early morning kill. 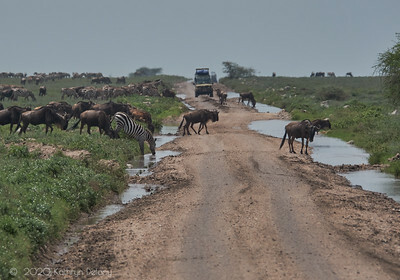 They are still covered with their meal and some mud too. Having had their fill, these lions wandered over to the road where we were parked and had a long drink from a rain puddle then flopped down to rest. For cubs it is an immersive expwrience. Look at that fat tummy! Caught out in the midst of Wildebeest and Zebra, this lone Eland! My Cape Buffalo looking rather disgruntled at being disturbed while having a drink. 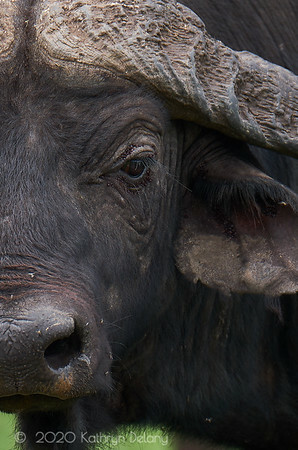 A different view of a Cape Buffalo , ticks and all. 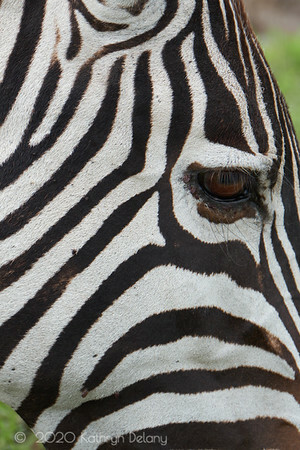 Young zebra have really red hair!